Escherichia coli, K-12 Strain, Living, Plate is rated 4.8 out of 5 by 4. This culture is the K-12 strain. 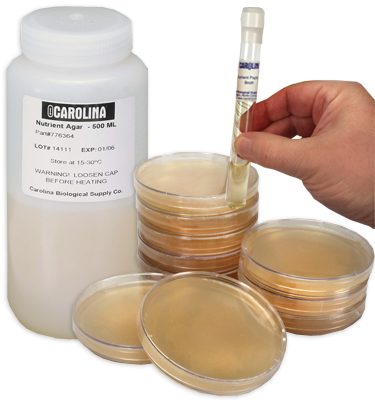 It is cultured on nutrient agar at 37° C on a plate. Each culture contains enough material for a class of 30 students. Culture is labeled by genus and species name and media on which it is cultured. All Gram staining is based on 24-hr cultures. Culture is guaranteed as to species and purity. Rated 5 out of 5 by Mark G from May have already had penicillin resistance Good viable sample, FAST service. Sample may have already had P resistance, reacted well to ampicillin, neomycin and erythromycin. Rated 5 out of 5 by DylanT from Commendable Product The plate contains E. Coli K-12 strain. The bacteria sample was viable upon receipt and produced a deep red color upon growth of MacConkey Agar. A lot of material is included in this sample plate. Streaked ten plates using roughly a sixth of the material in the plate. Packaged perfectly and came with instructions. Used immediately and got admirable results. The sample is able to be transferred from Nutrient Agar to another MacConkey Agar without issue. Rated 4 out of 5 by George from The culture is excellent quality, but it is only the one. The culture was excellent. It was perfect for my science fair project, however I expected it to include multiple petri dishes which it did not. Great base culture, but make sure you have all other materials. Rated 5 out of 5 by MomRN from Great growth! The E coli came in its tube ready to go. A sterile swab worked well to innocculate plates, as there was plenty of product in the tube, as the description states. Incubated at 37 degrees, there was visible growth in 12 hours and lush, thick growth in 24. Great product and easy to use.